Residents’ Parking: How is it for you? Cambridgeshire County Council is consulting throughout the city on residents’ parking, and most Queen Edith’s should be consulted in the next year. Demand in some streets is very high and the established schemes are popular, but we recognize that it’s not the right solution for everywhere. The city has been notionally divided up into 26 zones, each named after a street or landmark in the area: for example, in Queen Edith’s, we have Morley, Coleridge West, Coleridge East, Nightingale, Glebe, Perse, Wulfstan and Walpole. The Morley scheme is in place, Coleridge West is to be decided on in July, and a consultation for Coleridge East will start this autumn. The other consultations for this area are scheduled for spring 2018. It would be helpful to have an idea before that of whether or not there is a strong demand. Please let me know if you’re broadly in favour or not, by taking part in my preliminary survey. There are just three questions, so it shouldn’t take long. If you live in the ‘Morley’ residents’ parking zone (between Hills Road, Cherry Hinton Road and Blinco Grove), I have a different survey for you, as I am running a review of the Morley scheme now that it’s been in place for six months. There are questions on how it’s working, as well as one on short-stay spaces. Please give me your feedback on how things are going. Let me know if you’d prefer a paper version of either survey. Hi Mark, thanks for your comment. 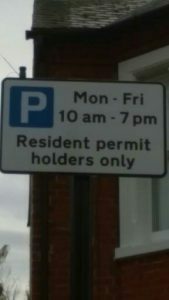 The Council charges for residents’ permits to cover the costs of enforcing the scheme (traffic wardens and admin. Otherwise it would have to come out of general council tax. The main reason many residents, who do not enjoy off-road parking, wanted the scheme was to allow them to park on-road near their home. In this respect the scheme seems to me to be highly successful. From regular random look-see there are usually parking spaces available on every road.